Thanks to the Travel Savvy Mom for this blog idea. We have had several people email us asking us how we made our website, or how we did something in our videos. The most common question we get asked is how we achieve the effect where the camera follows us as we walk through the airport or around town. Well, let me tell you. We'll start with the equipment. I did a lot of research before buying a camera because I needed something very specific. Everything we need for one year is in one backpack, so I didn't want to take up half of my backpack space with MiniDV tapes. We are also recording everything on video, so the video camera would be on me at all times. I really didn't want to lug around a big heavy piece of electronics. We needed something very small. Enter the Canon HF10. This awesome ultra-portable HD camera is super small and records directly to solid state memory (SDHC). It has 16GB of internal memory and you can plug in an SD card and record to that as well. I have a 16GB SDHC card, so I have a total of 32GB of memory I could record to. Just a little tip on recording if you get this camera - I record straight to the internal 16GB because it's faster than recording to an SDHC card. 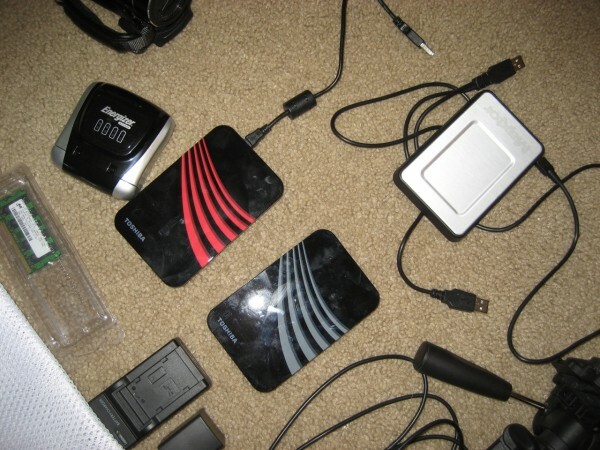 Then later you can copy the files from the internal memory to an SDHC card and then import them into your computer. We also have a little tripod that has proven itself invaluable. Since the Canon HF10 is so small, even the steadiest hand on the planet will not be able to hold the camera without the picture being all jumpy. Most of the time we just use the tripod as a stabilizer to give the camera more weight. The tripod has a lot more uses than you might think. It's also the secret ingredient to our "following camera" technique. All we do is extend the tripod legs fully but keep the legs closed. Then we tilt the camera to point down the tripod. We pick up the tripod by the legs and suddenly we have a camera man that follows us around the world. And we don't have to pay him. Or feed him. So now that we have all this footage we've recorded, we need to edit it for the weekly (or sometimes bi-weekly) video podcasts. For that, I use my MacBook Pro. I recently switched from a PC and I'm glad I did. It's been the best thing I've done in a long time. Wait a minute, you say, the MacBook Pro is not an ultra-portable laptop. True. It's not. But for as much power as it has to edit video, it's quite light-weight. I will gladly carry a few more pounds of silicone if it means I can edit videos fast. I mean, when you've got to create a new 5-10 minute video segment every week, you'll be glad you had a powerful laptop. This laptop has a 250GB hard drive which is really big for a laptop, but it's not sufficient to hold the massive HD video files I import on a daily basis. 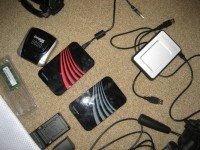 I have two ultra-portable 320GB USB hard drives. One is a backup of my computer and the other is just video files. I've already used about 80% of my video hard drive and we've been on the trip for just over a month. In order to feed the HD video more precious hard drive space in the future, I'm going to buy another ultra-portbale 320GB USB hard drive, copy all the video files over to it, then ship the other hard drive to the States where I'll have someone copy all the video files to yet another hard drive. Once they have confirmed with me that this is done, I'll wipe the hard drive I have here and start dumping new video footage to it. That's the best method I can think of to keep all our video footage. Let me know if you can think of a better method. As far as software, I use the Adobe CS3 Creative Collection. I use Premiere, After Effects and Photoshop to make the podcasts. Premiere is the general video editor that gives me lots of control over the sound and composition of the videos. I spend quite a bit of time trying to normalize the sound. Sometimes it's impossible to make the sound of someone taking audible, in that case I turn to Photoshop to create subtitles. Every subtitle that you see in one of the podcasts is a PSD file created with Photoshop. Actually, all the design elements - from this website to our logo was designed in Photoshop. Photoshop has a steep learning curve, but it's crucial to make things look pretty. After Effects is essentially the Photoshop of video files. It allows you to do things like the "Orin vs Andy-D" snippet in Episode #7. It's also what the intro graphic was made in. Be on the look out for a new podcast intro coming soon. The new intro will also be made in After Effects. After I finish editing a new podcast, I export it into 3 different files. One is a high-quality video for iTunes subscribers. Another one is a high-quality flash version for our site and lastly I export a "YouTube" version which has high compression for a smaller file. How do we post these big video files to the web? Well, that's something that seems to get harder to do as we go along. We use internet cafes for all our internet needs, but it's hard to find ones with reliable internet. Or even functional internet. Santiago is proving to be the hardest city to find stable internet access. So there you have it. Now go make yourself a fancy website about your travels! Y'know, I've been thinking about all that stuff and was just getting ready to send you kiddos and email asking you... especially the part about the "follow cam". I got my girlfriend Kirsten (who I met in St. Louis) addicted and watching, too. She even keeps watching when I'm not with her! Yup, i even beat Scott to watching the latest video update. It all looks so amazing! The volcano was beautiful in the pictures but there's a whole new feeling added by the video footage of that lava flowing by so close to you all. Best of luck with the rest of your adventures! I just found your videocast. You guys are doing such a great job! All that video editing while traveling...impressive! The volcano footage was especially cool! Looks like you speak another language, geek/nerd, I enjoyed this blog. We are all proud of you and miss you. Lots of people are enjoying your adventure. Hola Sam!!! Como estas ??? como lo han pasado en Chile ??? Also try to cross the "Canal de Chacao" (there is a "Ferry" (boat))to get to the "Isla grande de Chiloe", and from there, try to go to Dalcahue, specialy on Sunday, so you have the chance to see a tipical market. Ohhhh so many thing to see and to do!!! :) Hope you have a gtreat time and enjoy your visit there. People in that area are very friendly ..
Saludos y que lo pasen muuuy bieeen !!! @Dad - I miss you too. Love you. @Pelusa - Thanks so much for all this awesome info! I just got to Puerto Montt this morning. We are really excited about eating some real Chilean food. We're also going to be taking a boat down to Puerto Netales. We don't know which boat were going to use yet, but we'll know on Monday. We had an awesome time staying with the Contreas family while in Santiago. Thanks for that connection! wow. That is an intense process. Makes me think about how i will go about filming next year. How long does it take you to produce that 10 minute clip? @Nomadic Matt - that really depends on how well I shot the video footage. Sometimes I just shoot a small amount and it makes it hard to edit without any video context. But other times it's just a matter of cutting a few minutes of video out and slapping the clips together. But I'd say on average I spend about 5-7 hours on every vidcast. Are you going to be posting vids next year on your site? Very cool Sam, very cool! I've been silently watching your videos for a little while now. Great job! I was just curious what your export settings are in Premiere or After Effects. I've had a difficult time exporting a good quality video that's also relatively small in file size. Great post! I just got my hands on my new iPhone 3Gs (which has been waiting for about 6 months back in Australia for me to be somewhere I can receive it via mail! ), and so I can now record half-decent video - I really like the idea of video podcasting, so it's quite inspiring to see what you guys do. I love the follow-cam trick - I'd be interested in rigging up some kind of harness for hands-free action, too. Hmm..
Where'd all the money go?